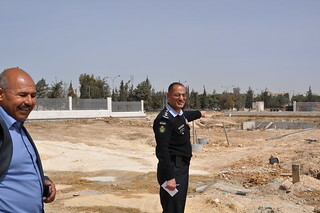 The pilot project in Jordan installed a decentralized wastewater treatment unit (WWTU) at the new Head Quarters of the Public Security Directorate (PSD) in Mqabalane, which is situated in the peri-urban area outside of Amman. The immediate goal of the pilot project in Jordan is to provide the PSD HQ with a sustainable source of water for its landscaping activities and to thereby relief it from costly freshwater supplies. The more long-term ambition of the Jordanian pilot project is to demonstrate the feasibility of using decentralized wastewater treatment units and reuse methods in order to overcome the shortages of the current centralized wastewater system, there where it is more cost-efficient. Baseline Assessment Study for the Jordanian pilot project. Mission for the Safe and Efficient Reuse of Treated Wastewater of the Jordanian Pilot Project. Demonstrate the potential of cost-effective decentralized wastewataer treatment and reuse systems at building level in peri-urban areas. Public Security Directorate (PSD) irrigation network design.